What is Plantar Fasciitis and what to do about it? Plantar fasciitis is an overuse condition of the soft tissue in the arch of the foot. The first step to understanding plantar fasciitis is to understand what the plantar fascia is and the role it plays in the foot. The plantar fascia is a broad band of dense connective tissue that attaches from the bottom of your heel (calcaneus) forwards to the base of each toe. Its main function is to support the arch of the foot and acts as a key component in foot function. Tension develops in the plantar fascia both during extension of the toes and in depression of the arch as seen in weight bearing. The plantar fascia is capable of withstanding a lot of stress and load during weight bearing but it’s not invincible. Too much load on the plantar fascia causes inflammation and irritation either at its attachment onto the heel or through the middle of the arch. Most people will complain of pain in the heel, which is worse in the morning or after a period of rest, improves during the day but will get worse again with too much walking. There is often tenderness at the front of the heel and stretching of the plantar fascia is painful and restricted. 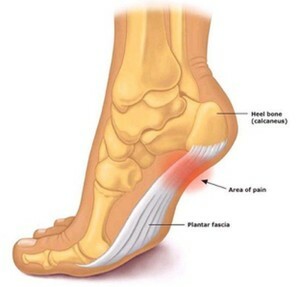 Treatment for plantar fasciitis addresses the biomechanical issues mentioned above through massage and manual therapy, shockwave therapy, IMS and Acupuncture, ensuring the correct footwear is worn, anti-inflammatories, taping, avoidance of aggravating activities, ice, specific stretching and strengthening exercises. Management of plantar fasciitis will generally require an extended period of treatment. It is not uncommon for symptoms to persist for as long as 8-12 weeks. Patience and persistence on the part of the patient in doing the recommended exercises is critical. You may have also heard about heel spurs. This is just extra bone that occurs where the plantar fascia attaches to the heel. This is the body’s response to the extra stress of the plantar fascia pulling on the heel bone. Having a heel spur does not necessarily mean you will have heel pain, it is simply an indication of an area of extra stress.